This is a wonderful, overdue piece–it was put together by Sahra Sulaiman, who did a terrific job. The City has a 20-year contract with outdoor advertising company CBS/Decaux to provide Angelenos with “street furniture.” The Coordinated Street Furniture program grants CBS/Decaux the exclusive right to install and maintain kiosks, bus benches and shelters, trash cans, and outdoor restrooms in exchange for the right to sell and display advertising in the shelter and kiosk windows. The arrangement, initiated at the end of 2001, is intended to provide the city with a share of the revenues generated by the advertising. Not even this rationale makes sense. Large universities? I work at a “large university” and our bus stops are crap and unshaded too, because we’re in that universe of terrible city service, south of the 10. 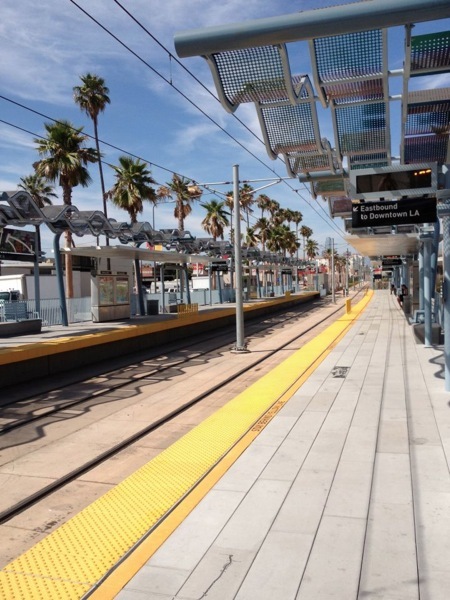 LA shouldn’t be ashamed of its transit–but people are. It SHOULD be ashamed of its bus stops. While the above-ground light rail stations have been explicitly designed to shelter patrons in unique and community-pride enhancing ways, the more frequently used approximately 9,000 bus stops around the city have suffered from significant neglect. The Expo Line stations have decorations, not shade. Those stupid wavey things look nice (I guess) when you drive by them, but they are generally useless for shade except at noon. Most of the rest of the day the sun bakes on one platform or the other while the shade falls brilliantly onto the tracks…so useful. Well done, architect.